N8 Medical is developing products designed to reduce complications associated with the use of many common medical devices. N8 Medical developed technology to address hospital-acquired infections, as well as technology to reduce inflammation and improve healing. Infections are a leading cause of illness and death worldwide. With the rapid rise of drug-resistant bacteria, nearly 70% of infections in the U.S. are now drug-resistant, making the problem one of the most serious in the medical field. Hospital-acquired infections and healthcare-associated infections (HAIs) are a large and growing problem that costs the U.S. healthcare system $33 billion annually. HAIs are estimated to affect more than six million persons annually in the United States, European Union and Japan combined. Of the approximately 1.7 million HAIs in the United States annually, nearly 100,000 patients die from these infections and many more require extended hospitalization and medical treatment. HAIs can occur during any procedure that breaches the skin or introduces a foreign object into the body, including catheterization, intubation, intravenous procedures and the use of surgical implants and devices, which collectively account for 70% of HAIs. 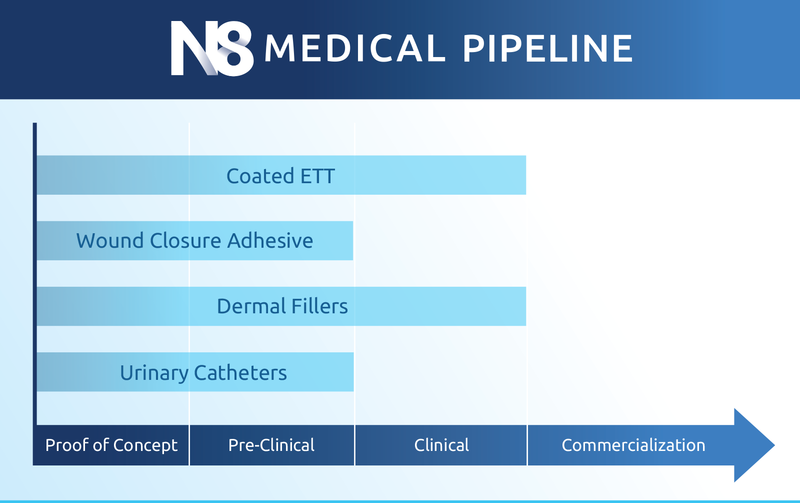 N8 Medical is also pursuing two additional categories of devices that leverage the anti-inflammatory and wound healing properties of ceragenins: wound closure devices and an enhanced dermal filler. In addition, N8 Medical is developing several CeraShield™ technology approaches that can be deployed as a platform across the medical device market, and that are applicable to materials commonly used for medical devices, such as silicone, PVC, polyurethane, stainless steel and titanium.